Unfortunately people and tribes degenerate. They lose their teeth, forget their language, until finally they're bending meekly on the fields and cutting straw with a scythe. Leemut, a young boy growing up in the forest, is content living with his hunter-gatherer family. But when incomprehensible outsiders arrive aboard ships and settle nearby, with an intriguing new religion, the forest begins to empty - people are moving to the village and breaking their backs tilling fields to make bread. Meanwhile, Leemut and the last forest-dwelling humans refuse to adapt: with bare-bottomed primates and their love of ancient traditions, promiscuous bears, and a single giant louse, they live in shacks, keep wolves, and speak to snakes. 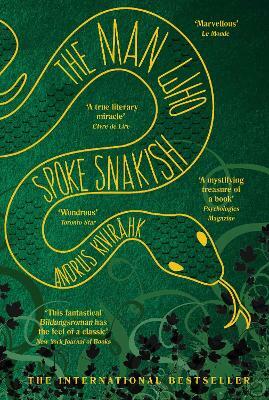 Told with moving and satirical prose, The Man Who Spoke Snakish is a fiercely imaginative allegory about a boy, and a nation, standing on the brink of dramatic change. Andrus Kivirahk is one of Estonia's most highly regarded contemporary writers. A journalist by profession, he is known for his satirical newspaper columns and his bestselling novels. A popular board game has been created on the basis of The Man Who Spoke Snakish. He lives in Tallinn, Estonia. Christopher Moseley is a translator of Estonian and Latvian. He teaches at University College London and is Treasurer of the Foundation for Endangered Languages.